Benefiting from the TDMA technology, PD78X/PD78XG allows twice the channels based on the same spectrum resource. This is a big help to relieve the stress of increasing shortage in spectrum resource. PD78X/PD78XG can operate in either analog or digital mode. It is compatible with the prevalent analog system, ensuring a smooth analog-to-digital transition. Besides the basic encryption of the digital technology, PD78X/PD78XG provides enhanced encryption capability (such as 40,128, 256-bit encryption algorithm) and the Scrambler feature (selectable). PD78X/PD78XG supports data capabilities of sending Private, Group text message. It also supports Third Party to control the radio via Third party API (GPS, Radio Registration Services, Radio and Call Control, Telemetry*, Data Transfer*), via Telemetry control to radio. PD78X/PD78XG supports various analog signaling types (HDC1200, DTMF, 2-Tone and 5-Tone), various squelch control types (CTCSS/CDCSS), thus providing higher function expansion capacity to the analog world. PD78X/PD78XG supports supplementary services of Radio Check, Remote Monitor, Call Alert, Radio Enable and Radio Disable. Hytera PD78X/PD78XG provides a dedicated emergency button. In case of any accident, a press on the button will trigger an alarm and initiate a voice call to a pre-programmed work fellow or group. Built-in Man-down, GPS and Lone Worker functions are also a available with the digital portable. 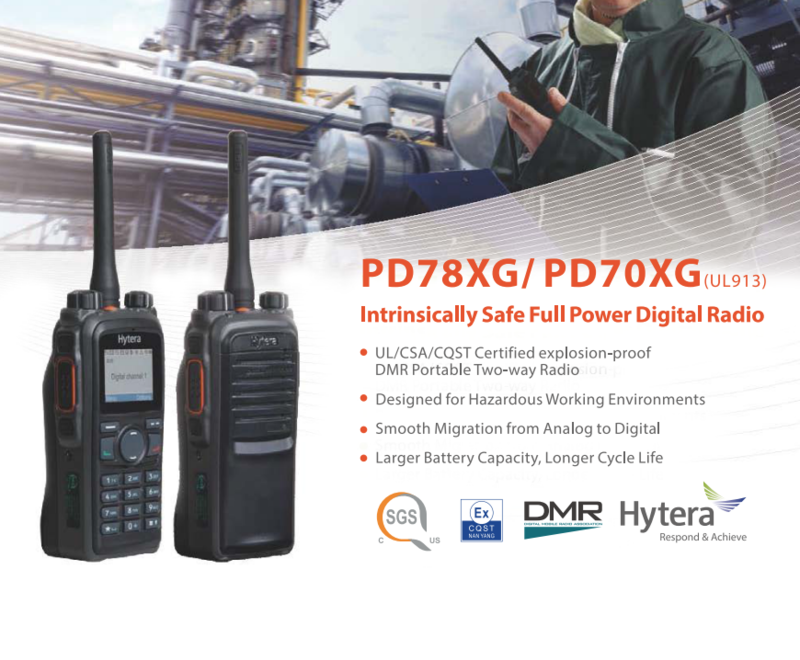 In addition to conventional communication services, PD78X/PD78XG features rich data services and selectable functions such as Text Message, Scan, Emergency, Man Down (optional), Auto Registration, High-speed Data Transmission and Lone Worker.